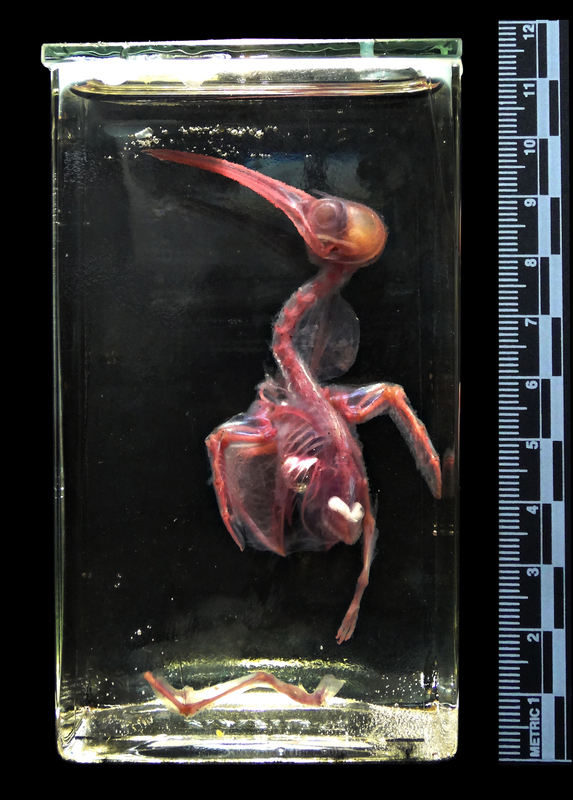 It look a few minutes for me to work out what family this bird belongs to, because it’s been treated with alizarin and it just looks plain weird (if you want a bit more information about this sort of preparation check out my latest Specimen of the Week on the Grant Museum of Zoology blog). I still haven’t narrowed it down to genus yet, so your thoughts would be much appreciated. Have fun! let me just say i’m excited to be the first to post… a rare opportunity being on the left coast across the pond, though that might be more due to the fact this looks like a difficult puzzle. a juvenile specimen without fully formed wings distorts it’s appearance, but long neck and what seem to be webbed feet. i’d guess cormorant, but the skull doesn’t look right. Humm, I wonder what this could be. I suspect it’s at adult size, which combined with some features of the postcranial skeleton makes me strongly suspect one particular family. If both legs, rather than just one, had fallen off, I suspect its order name would suddenly seem apropos…I don’t recognize the beak though, though it’s gotta be something distinctive. Also, Pygostylia strikes me as an excessively broad taxon. Could they really not rule out it being a confuciusornithid or an enantiornithine? Is it a cousin to the boomer in the bulrushes? My best guess is Whimbrel. Nothing better than starting with a hokey pokey reference. It can only get better. My first thought was a barely out of the egg member of the Ibis family (Threskiornithidae)..but I couldn’t find any pictures of young ones with beaks so curved. And the photo seems to show three toes…so I’m going to have to go with a particular genus in the family Scolopacidae…and although my wife might need to find a ‘new man’ if I get this wrong.